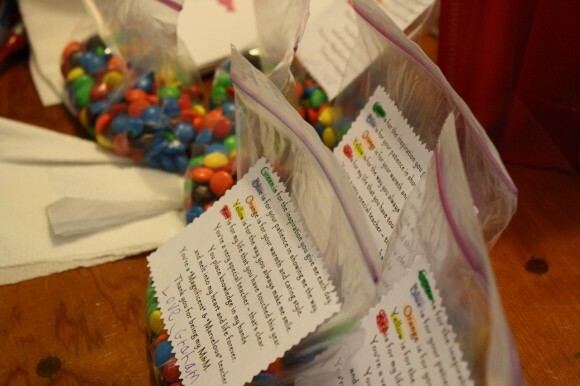 Last year, we gave 18 bags of M&Ms to some very special choir and percussion teachers. 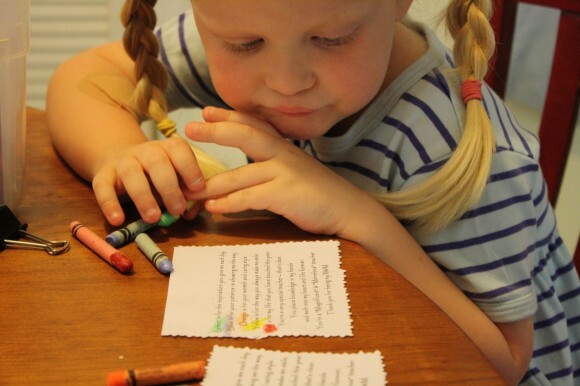 Using the instructions from Domestically Speaking, we printed the poem. I emailed Hodgepodgedad and asked him to pick up two big bags of M&Ms from Sam’s Club warehouse store. We simplified the directions and used the 1 cup measuring cup. Filled press and seal sandwich bags. This morning, I put the crayons, bags and tape on the kitchen table. Four-year-old did some beautiful coloring. Great practice with matching the color with the word. 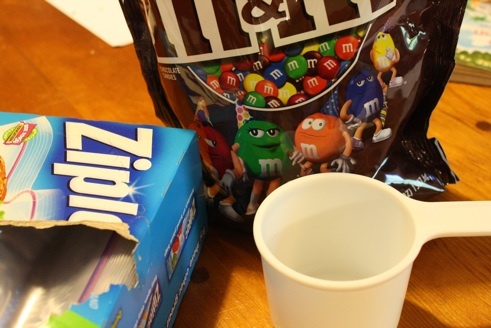 Plus, any project with M&Ms is just plain fun. Click over to Domestically Speaking to cut and paste the poem. (We modified it a bit since we didn’t use a jar). Then go bless some teachers! This is a great idea – I will forward it on to my co-op-ey friends. 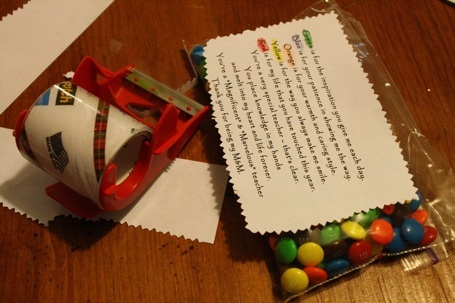 I did click into the post thinking selfishly – that the M&M’s would be a good thing to show up in the Workboxes or such this morning and I was ready to drive to the store . . . . ha ha. 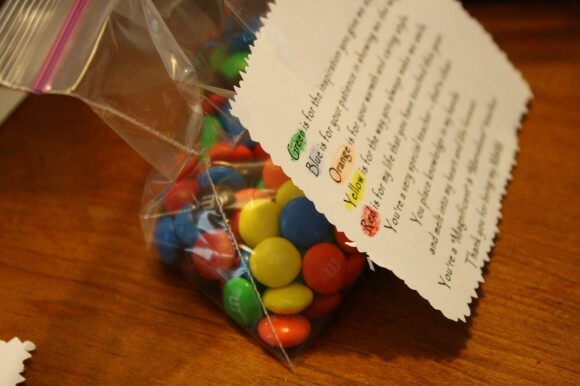 I did have a hard time one year we were involved in classes to come up with a simple thank you token outside of a bag of cookies, this would be very sweet! That’s a great idea to put all the ingredients in a workbox Angie! Nana found this idea last year for us via her Google Reader 🙂 We’re working on a little something else to pass out to choir teachers this week. Will share soon! Cute! 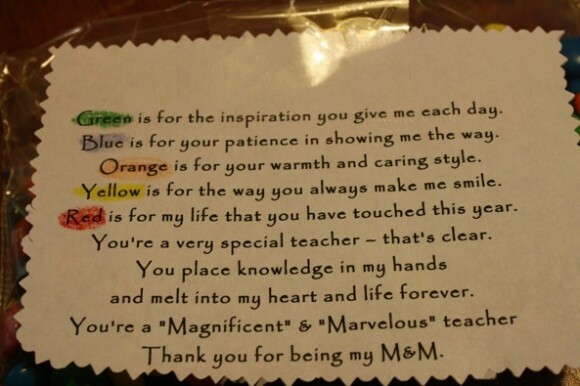 I’m going to use this for the boys’ French teacher! Thanks for re-posting a great idea.